Pioneers in the industry, we offer table tennis flooring, volley ball court flooring, indoor sports courts, pvc indoor sports flooring, indoor sports flooring and table tennis court flooring from India. 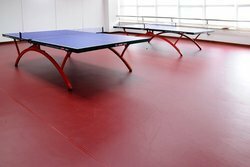 We are engaged in offering a wide range of Table Tennis Flooring, these are manufactured from high grade quality material. our client can avail these snooker tables at very reasonable prices. 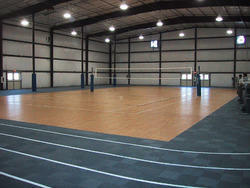 We have gained rich industry experience in the field of manufacturing Volley Ball Court Flooring. Under the supervision and able-guidance of the industry heads, we have developed these floorings in many of the different and unique patterns that meet each and every need of the clients sufficiently. Besides this, our range is delivered in safe packaging and at most affordable rates in market. With thorough knowledge of this domain, we are instrumental in offering Indoor Sports Courts to all our prestigious clients. The offered products are manufactured using optimum-grade timber that is sourced from certified vendors of market. PVC indoor sports flooring is made out of polyurethane material which makes it possible to distribute stress evenly making performance efficient for players. 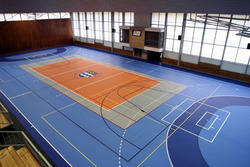 PVC indoor sports flooring safeguards the interest of players by giving good grip and prevention from injuries caused usually playing on conventional floors. Because they are made out of the inflatable mattress, it effectively provides a buffer to the players thereby reducing injuries caused by falling down. 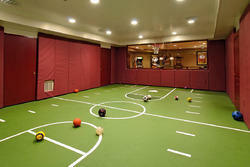 PVC indoor sports flooring has a good rebound quality which helps a lot while playing games like basketball and squash. 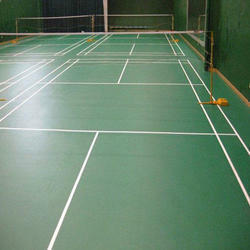 Nowadays PVC indoor sports flooring are also available in most eco-friendly form. We provide specialized Indoor Sports Flooring, which is used for the weightlifting areas, yoga/pilates, skating rings etc. Both roll and tile format available. It's for protection of athletes and seamless flooring. Clients highly prefer our range for its durability, environment-friendly nature, nonslippery surface, impact absorption and easy installation. We offer this range at industry leading prices in the desired specifications. 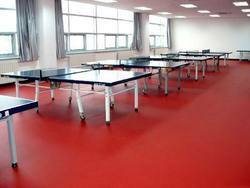 We provide specialized Table Tennis Court Flooring, which is used for the weightlifting areas, yoga/pilates, skating rings etc. Both roll and tile format available. It's for protection of athletes and seamless flooring. Clients highly prefer our range for its durability, environment-friendly nature, nonslippery surface, impact absorption and easy installation. We offer this range at industry leading prices in the desired specifications. Looking for “Indoor Sports Floor”?